I have hunted high and low and cannot find an answer. 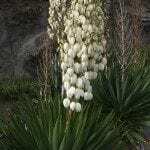 How do you make/persuade/help a Yucca tree to make offshoots/sprouts/pups? Everyone knows what to do once you have them, but how do you make your Yucca sprout offshoots? None of these methods is for sure, but they may increase the chances your yucca will produce pups.